Last time, we reviewed a basic ninja - today we go deluxe. The bio text on the package for the deluxe ninja is the same the text for the basic, so that paragraph is the story text for the line as a whole. So, Deluxe Ninja. Every piece of info we gave you about the Basic Ninja holds true here: same sculpt, same accessories, same everything. Except the paint, since that ninja was red and this one is black. If they'd offered a Deluxe Red Ninja, rather than just Basic, I'd have gotten that one (because Daredevil needs some Hand to beat up). And while I do want a 6" Storm Shadow, if you're only going to get one ninja, you're always going to choose black over white, right? Red was only available as a Basic, white is only available as a Deluxe, but black is available as both. Sorry, Naruto, there is no option for Orange. While the "totally not a Hand ninja we swear for god's sake please Disney don't sue us" red ninja had creepy green eyes, the black ninja is more human. The eyes visible through the tight mask are painted pretty well (better than we've seen on some mass market toys, at least), but the zukin mask has misaligned eyebrows that make him look... worried? Enough re-use, let's talk new! 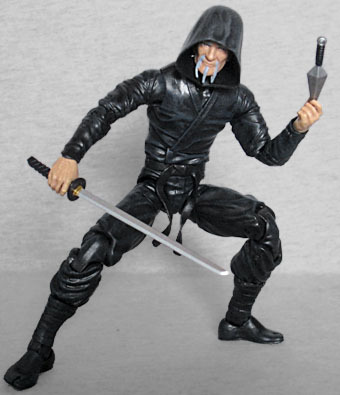 The deluxe ninja comes with an unmasked head, showing us what appears to be the Ninja Master mentioned in the story - at least, you don't get to be an elderly ninja unless you're also a pretty masterful ninja. He's balding and wrinkly, with his remaining hair pulled into a top knot. He has a mustache and beard thingy, both very stringy. It's a very nice sculpt, with an excellently sharp level of detail. And since the top knot can be removed, you can even choose to have him wearing the hood with it. In addition to the two masked heads and the two hood options - up or down - the Deluxe Ninja also includes a red oni mask. It's got white fangs and golden horns, and a black sash ties it in the back. The entire thing is molded from soft PVC, so it can slip on over the figure's face. It's even designed so his eyes and mouth are visible through the mask's eyes and mouth! It fits on either the unmasked or tight-masked heads. The ninja moves with a balljointed head, hinged neck, swivel/hinged shoulders, swivel biceps, double-hinged elbows, swivel/hinged wrists, balljointed hands, a swivel/hinge torso, swivel waist, balljointed hips, swivel thighs, double-hinged knees, swivel shins, and swivel/hinge ankles. The hips are very hard to get moving - like the plastic of the leg is gripping the plastic of the joint, rather than moving past one another. This keeps the legs very sturdy, but also makes us worry the joint might shear off in the future. We get most of the same accessories as before: two swords in scabbards, a sash, a kunai, and extra hands in chopping and gripping poses. 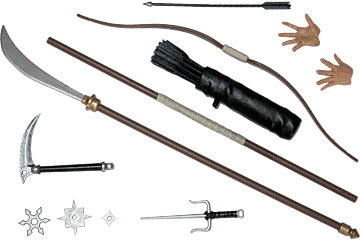 The short sword is not the same mold the basic ninja had: it's a straight blade, while that one was curved. 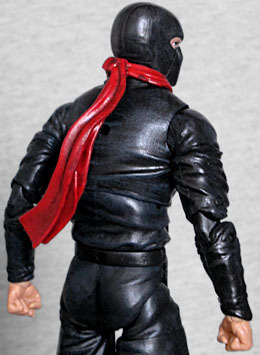 And since his gi is already black, the black sash does not make as strong a visual difference on this figure as it did on the last - but hey, since he gets a new red scarf, he's not entirely without some flair. That is not where the accessories end, however. The Deluxe Ninja earns the additional $15 in its pricetag by also including a pair of hands with splayed fingers, a bo staff, a kama, a sai, three shuriken of varying sizes and styles, a kusarigama, a bow, an arrow, and a quiver. The quiver itself has a bundle of other arrows all molded together, and that can be removed as a single chunk if you want it to be empty. As if that weren't enough, he also gets a display base. One of the rewards in the Articulated Icons Kickstarter was a modular rooftop base. 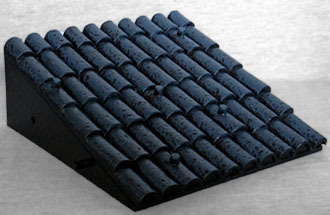 It's a simple piece, 3⅞" square and 1⅝" tall at its highest, designed to look like overlapping clay tiles. It's molded in black with blue apps to give it depth, and has five footpegs on the sloping top. There are screw holes in the back so you can mount it on your wall, and tabs/holes on the sides so you can put a bunch of them together for a longer roof. The basic ninja was a good figure, but the deluxe is even better. Yes, it's fundamentally the same toy, but all the extra accessories give it a lot more options. And if you got a Basic, you can share the goodies around.